Miracle Wart Cure!?! We shall See? Sully, the oldest of my twins was badly burnt by scalding hot coffee when he was 2 and a half; he is now 4. It healed up nicely and we skimmed having to have a skin graph! Then last September I began noticing small dots on his forearm – odd flat looking warts. Within months they spread clear up to the bicep! I took him to the Dr. once and we decided not to burn them until he is a little older; being that the area has been damaged we could only imagine burning the warts may be extremely painful. He actually complains that the warts themselves are painful but I think it is more because of the skin they sit on. But still no one wants to hear they child complain of pain…. So yesterday I picked up some CitraSolv at the health food store here in town. My friend had been using it to rid herself of a wart that had been burnt multiple times and still would not die. Within no time her wart was completely gone! Last year was my first year of packing school lunches. I bought each of the kids lunch boxes and awesome accessories and would pack them – regardless if the twins were going to preschool or not. By the end of the school year I was seriously sick of making sandwiches… although the kids never complained, to me I was sick of them and I wasn’t even the one eating them! I decided this year I going to be super organized, starting with buying more lunch box arsenal. Lunch Box: Thirty One Bags. Personalized so NO one will steal it! Reduce Bottles: My kiddos are lactose intolerant so I bought them last year to make chocolate milk at home and send with them… I ❤ them! I am buying more because some of them are nasty on the inside but they are worth every penny. Itzy Ritzy Reusable Baggies: If you don’t own them- buy them! I have a bunch of different brands but Itzy Ritzy is where it is at! Reusable silverware – it’s all about saving the enviroment right!? Ice Packs. I didn’t use them last year, but Zion complained that his yogurt was soupy and if I froze it, it wasn’t defrosted by his 10:30 lunch. Getting my menu organization on…. A few of the recipes I have I can freeze the extra for the next rotation. Also I can make a few as dinners and use the next day as leftovers for lunch! I’m so ridiculously excited about this! My favorite recipe I have come across so far is Pizza Muffins – isn’t that inventive and fun!?!? Categories: Organizaion | Tags: Itzy Ritzy, Organization, Packed Lunch, Reduce Bottles, Thirty-One bags | Permalink. A New Motto Goes a Looong way!! The past few weeks I haven’t felt like I have been working out at all, but in actuality I have burning the calories UP! Jogging has always been a struggle for me, yet it is always the first thing I grasp too when I start a “new” workout regiment – knowing full well, I hate it, I’m not good at it, I get discouraged, and I quit working out because of it. 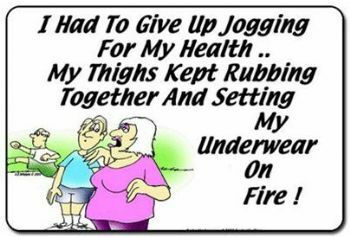 So no more jogging!!!! It feels like a workout EVERY time I go out to do it…. and since I declared this as my new motto, I feel so much lighter and happier knowing I am not going to be torturing myself any longer! Will I give it up forever? Who know! But for now – It feels like a workout so I’m not doing it! Categories: Uncategorized | Tags: healthy-living, workout regiment | Permalink.